Mughal art, the art produced in the Islamic empire in India, is fascinating because of its blending of artistic traditions from other Muslim lands, indigenous Indian art, and western European influence. As in Western Europe, portraiture became a significant subject matter in art only from the 15th century onward. Figurative art in Islamic lands was primarily secular, consisting mostly of palace interior decoration and, after the 8th century introduction of paper from China, the illustration of books. From the 13th century on, illustrated books depicting battle scenes, historical events, and even genre scenes flourished. Islam began to spread in India in the eighth century when Arab armies invaded parts of northern India. By the eleventh century, missionaries from countries such as Saudi Arabia, Yemen, and Iran were moving to India to further the spread Islam. The Turkish general Qutb ud-Din Aybak (1150-1210) was almost single-handedly responsible for conquering most of northern India (and current-day Pakistan) for Islam. He was made Viceroy of Delhi and eventually moved the capital of Islamic India there. As sultan he was the first Muslim ruler in south Asia. The Mughal rulers of India (1526-18th century) were strongly influenced by the Iranian courts, and imported artists from Iran. The Timurid (1350-1502) and Safavid (1502-1736) dynasties in Iran are considered the high point of manuscript decoration and painting in Islamic lands. Portraiture experienced a renaissance, especially during the Safavid period. Book arts and painting in Mughal India were reinvigorated in the mid-sixteenth century by Iranian artists. These artists migrated to India when interest in painting and calligraphy waned in the Safavid court. 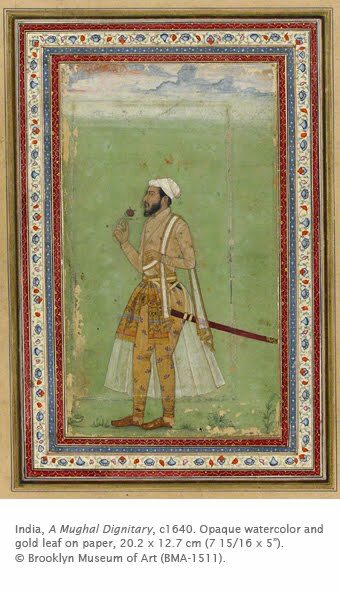 The greatest flowering in Indian painting came during the reign of Akbar (died 1605), a great patron of the arts, when the number of court artists, including some European artists, swelled to one hundred. Bookarts became less important in Iran, and consequently in India toward the beginning of the seventeenth century. Single-page works of art became increasingly popular because lavishly illustrated books tended to be extremely expensive. 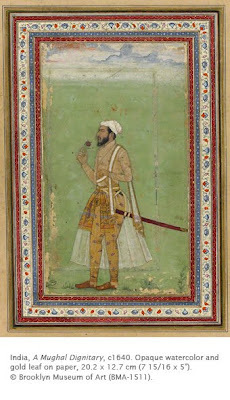 Most Mughal portraits in the early 17th century, like this one, were of men. Women did not participate openly in the court, although they were frequently depicted generically in genre scenes. This portrait of an unknown dignitary shows the conventional combined profile/three-quarter pose, where the dignitary is depicted with attributes of his rank. While he carries a large sword to indicate his courage and strength, he also sniffs a flower to indicate his sensitivity and love of nature.